2018 was a huge year for cannabis stocks. Companies everywhere looked to jump into the fray byways of IPOs and big investments. Pot stocks were all the rage for most of 2018, and analysts on every major media outlet were putting out their cannabis stock picks. It’s suspected that many of the same retail investors that pumped up cryptocurrency prices in 2017 have moved their funds into marijuana stocks. That’s one explanation for the high level of retail investor interest in these stocks. Despite the hype, if you’re a believer in the marijuana industry’s potential, an investment made in one of these stocks today could see huge gains down the road. On October 17th, 2018, Canada became only the second nation to legalize marijuana. The day marked the end of one era and the start of a new one. In the US; Michigan, Missouri, and Utah enacted favorable cannabis legislation in 2018, and a wave of pro-pot candidates were elected to house and senate seats. Suddenly marijuana was becoming more and more accepted by the widespread public. Public opinion on cannabis has changed dramatically in the past 10 or 15 years. These days, we’re in the midst of cannabis craze. 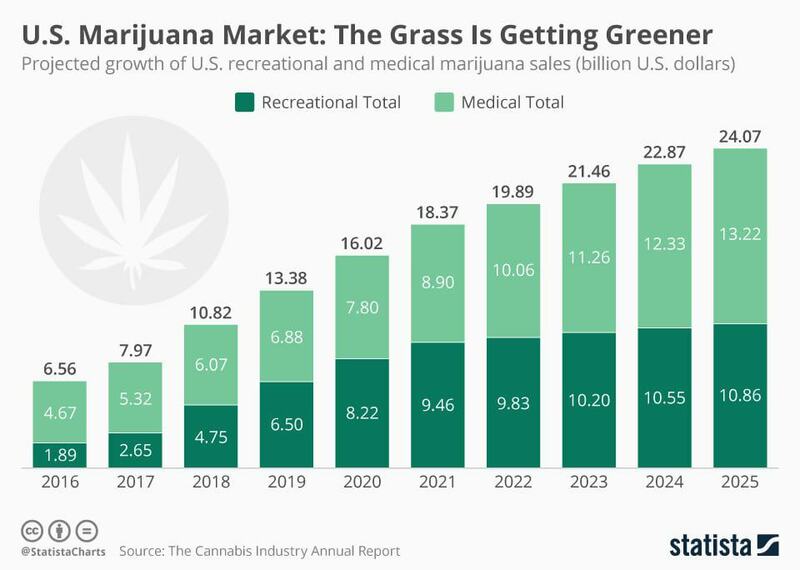 2019 is expected to be an even bigger year for the still-fledgling marijuana industry. Research estimates global marijuana spending to reach $32 billion by 2022, more than tripling 2017’s $9.5 billion. In 2018, pot stocks boomed as marijuana mania rocked the investing world. Leading up to the day Canada was scheduled to legalize, cannabis stocks saw a frenzy of activity. Law-abiding investors were seizing the opportunity to invest in the newly legitimate business. Many analysts on Wall Street blamed these retail investors for the unprecedented volatility in the stock. 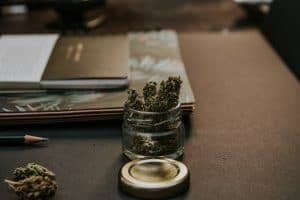 The prospects of such lucrative gains have many looking to take a bite out of the cannabis market. However, it’s not easy figuring out where to invest your money in a space populated with pop-up companies looking to make a cash grab. Investors should examine companies closely before purchasing marijuana stocks. Some analysts view marijuana as a commodity, but almost all cannabis stocks are trading at much higher earnings multiples than traditional commodity-based businesses. However, evaluating marijuana companies the same way as you would traditional commodity-based businesses would be a mistake. To the uninformed, the cannabis industry can be somewhat confusing. Calling cannabis a commodity is a huge over-simplification. The industry is multi-faceted and there is a litany of different products. For example, the Agricultural Improvement Act of 2018, aka the farm bill, legalized the sale and cultivation of hemp and CBD on the federal level. Large, interstate companies were finally able to connect their domestic supply chain resources and improve distribution. Hemp is a male-gender cannabis plant, it contains mostly CBD and very little THC. Typical marijuana plants are female and carry mostly THC. Until the farm bill was passed, hemp was banned because of the trace amount of THC in it. Many on Wall Street are predicting that 2019 will be the year that many of these half-baked cannabis companies get their acts together and become mature, profitable businesses. The industry saw a significant amount of M&A activity in 2018, and the purchasing companies are looking for those investments to start paying off in 2019. Though marijuana stock prices may have calmed since the wild volatility we saw over the summer of 2018, the stage is set for cannabis stocks to take off again in 2019. If you got left in the dust last year, don’t make the same mistake. We’ve listed 5 marijuana stocks to help you start building positions in quality companies today. Start your research with our five best cannabis stocks for growth in 2019 and get educated on the industry before you buy. ( NYSE: CGC ) Canopy Growth is one of the steadiest hands available amongst marijuana stocks. The company got a vote of confidence when Constellation Brands ( NYSE: STZ ), best known for producing Corona, made a $4.5 billion dollar investment. They purchased 38 percent of the business at $48.60 per share in an attempt to enter into the cannabis market. Since then, it hasn’t been a smooth road for Canopy. The stock fell to the mid-twenties towards the end of 2018 but, since then, it has rallied back and now sits around the same price Constellation for their stake. In December, the company announced a partnership with AB InBev to research the prospects of producing non-alcoholic beverages infused with THC / CBD for Canadian customers. Both companies invested $50 million in research and investors liked the news. CGC was up 1% after-market on the news. The stock has seen big jumps anytime news came out regarding the Canadian company’s U.S. expansion. They plan to produce over 14,000 pounds of hemp annually to expand their CBD business, as well. Canopy has strong financial backing via Constellation, and they have been steadily making quality acquisitions. The prospects for the future look good as Canopy looks to continue growing into 2019. ( NASDAQ: CRON ) Cronos Group made its IPO on the NASDAQ in 2018, and the stock went for a wild ride during that course of time, along with the rest of the cannabis stocks. The stock saw it’s first big pop when the company’s second-quarter earnings showed revenue growth of over 400%. Cronos doesn’t operate any marijuana growing facilities, it’s a principal investment firm. The company, formerly known as PharmaCan Capital Group, provides equity capital to businesses that produce medical marijuana under Canadian MMPR(Marijuana for Medical Purposes) regulations. Cronos offers cannabis and cannabis oil under the brand name “Peace Naturals”. Recently, an increasing portion of their sales revenue has come from cannabis oils, and Cronos has made several investments to promote their development of such products. Cronos is developing a new extraction lab and has announced a partnership with Ginkgo Bioworks to develop a manufacturing method that would produce organic cannabinoids without extracting them from a plant. The technology could prove to be a game changer. Large-cap companies were beginning to take notice of Cronos Group’s culture of innovation until, finally, Marlboro manufacturer Altria ( NYSE: MO ) announced their plans to take a 45% stake in the company for approximately $1.8 billion. The stock promptly tripled from its Q2 lows and has barely dipped below $20 a share since. Altria, formerly known as Phillip Morris International, produces Marlboro cigarettes and other products. The deal should prove to be beneficial to both parties in the long run. This deal positions Cronos Group for the future and gives them a solid financial foundation to rest on. Look for CRON to be an enduring presence as the marijuana industry continues to evolve. 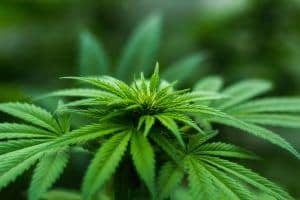 ( NASDAQ: TLRY ) Tilray is a full-service cannabis enterprise. It operates in a variety of marijuana-based capacities and has international distribution streams in several countries. Based in Nanaimo, Canada; the company has a mid-sized market cap of around $7.3 billion. Tilray made its IPO in July of 2018 and, by September, the stock peaked at approximately 15 times its IPO price. The stock went to $300 per share before crashing down to Earth. This stock has been extremely volatile since its initial public offering, but the hysteria has settled as of late. Since then, Tilray’s stock has been consistently trading around $75 per share. Tilray missed its earnings forecasts for Q2 and Q3 in 2018. However, there is growth potential that makes the stock attractive even at such a high valuation. Tilray boasts an impressive list of international licenses and is approved to operate in Australia, New Zealand, Canada, Argentina, Germany, Chile, and more. With all their international experience, it’s likely Tilray has intentions to widen its international exposure further. Although the stock has stabilized recently, it frequently exhibits exaggerated reactions when it moves. This cannabis stock isn’t for traders with small appetites for risk. If you can weather the volatility, there’s a chance that building a position in Tilray now will pay off big time in years to come. ( OTC: MMNFF ) MedMen Enterprises is the first U.S.-based cannabis company on our list. The company has products for both recreational and medical users. It operates all phases of cannabis production, including cultivation, production, and distribution. The company (located in Culver City, CA) controls a domestic cannabis empire that has a presence in 13 states. Medmen has the supply chain in place to take advantage of America’s emerging marijuana market. Plus, Medmen has both recreational and medical revenues. Canada has legalized recreational cannabis across the country, but markets are still emerging in the U.S. As a result, there are opportunities for American-based companies, like Medmen, to expand. Fortunes will be made as America’s cannabis industry continues to grow. Medmen and other American cannabis companies are in prime position to be very successful in these new markets. The stock is relatively cheap and it’s not listed on any major exchange. However, it has also been under fire as of late. The CFO resigned in late 2018 after a bungled round of equity financing ended up costing the company approximately $45 million. The company has also been spending cash at an absurd rate, and management has been criticized for spending company shares too liberally. However, if Medmen gets their act together the stock could see a big jump back up to its previous highs. ( NYSE: ACB ) One of the most diversified cannabis stocks on the list, Aurora Cannabis boasts a diverse portfolio of cannabis operations. The company has exposure to the entire cannabis industry. The company produces cannabis, concentrates, edibles, CBD, and more. Aurora also has research operations developing an array of cannabis-related products and expertise. Aurora operates several subsidiaries and brands that cater to every imaginable niche of the consumer marijuana market. Some of its brands include CanniMed and CanvasRX. The company has collaborative agreements with PharmaChoice and Shoppers Drug Mart to help facilitate distribution to medical customers. The stock has traded with stability in comparison to the other marijuana stocks listed here, but it still exhibits some dramatic moves. Interestingly, Aurora is possibly the only company on this list to have positive EPS numbers last year. While other companies are burning through cash, Aurora is at least netting some positive earnings. However, the company is still in the midst of significant expansion. There are not many marijuana companies that can produce more at peak capacity than Aurora. That gives them a huge advantage in the Canadian marijuana market. While Aurora is undoubtedly one of the largest producers, it still has some hurdles ahead. They will be facing increasing competition this year as other upstart companies begin to take market share. Aurora will have to work harder to compete in an increasingly crowded space moving forward, but they have the production and infrastructure to make it happen. While legalized Marijuana has been the topic of much speculation, buying cannabis stocks is an uncertain venture. A lot of the companies are still in their infancy. Since the industry is relatively new, the companies don’t have established track records like other, more traditional stocks. Many marijuana stocks that on the rise today will go bankrupt. Also, pot stocks often exhibit incredibly exaggerated volatility because of the large presence of undisciplined retail investors. However, for the discerning investor who can spot a good company, picking the right marijuana stock today may make you a very wealthy person one day. In the meantime, try not to get an ulcer. Owning these stocks can take you on an emotional rollercoaster. Do you own any Marijuana Stocks? Let me know in the comments below!